The gym can feel like an intimidating space, only for the super fit and strong. Psychologist Glenn Mackintosh shares some advice. There are several reasons why people feel uncomfortable about going to the gym, so it’s important to understand what your barriers are. Negative body beliefs, which come in the form of self-judgments (e.g. “I’m too fat”), comparisons to others (e.g. “I’ll never look like that”), and worries about others’ opinions (e.g. “What is she doing here?”) can give rise to a lot of anxiety. If people are not used to navigating the gym floor, using the equipment, or exercising in general, then they may lack confidence, and if we feel intimidated when we’re doing something we’ll tend to lose motivation and want to head for the door. On top of this, we naturally have anxiety around approaching new environments, so some of it is just the newness of the place until we become familiar with it. While we often assume the experienced gym goers are judging us mere mortals, the reality is probably the exact opposite. To develop such a high level of skill and fitness (not to mention physique) the most seasoned gym goers have to put their blinkers on and focus solely on themselves. They are so into their reps, sets, and PBs they probably don’t even realise you’re there, let alone have judgments about your presence. Remember, the gym is for everybody. Whether you’re a competitive body-builder training 12 hours a week or it’s your first time stepping through the door, you have the right to improve your health and fitness, and any good gym will support you from where you are starting. If you are feeling too self-conscious about your weight or fitness level, there’s nothing wrong with warming yourself up to exercising in public with your own fitness regime first. 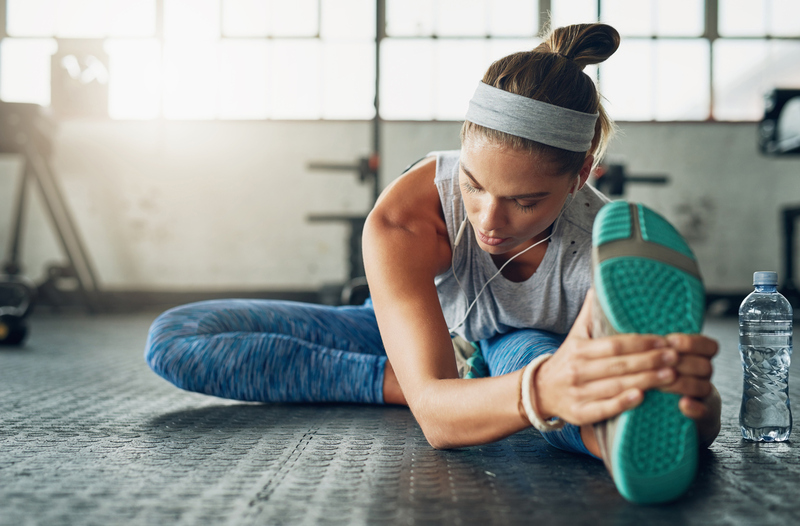 You can start in the comfort of your own home with exercise DVDs, walk around the backyard, or even buy some exercise equipment to get you started. At some stage though, it’s important to work through your self-consciousness and get out there in the world. Just remember that you have a right to take care of yourself at any age, shape, or fitness level. If you notice any thoughts that tell you otherwise (“What will other people think?”) remind yourself that are only thoughts – let them come and go as they please as you tie your shoes and get out the door! As with overcoming any fear or anxiety, the key is to be brave and put yourself in the new situation until you get used to it. Many of my clients are surprised how quickly they will pick up the rules, learn how to use the exercise gear, and get comfortable in their new environment. As they become more familiar with their surroundings they often find the gym is not so daunting and can even be fun. Sometimes some of those ‘secret members’ even end up becoming new friends – which I guess means you’re now a part of the club! So often we place unnecessary pressure on ourselves based on what we think we ‘should’ be achieving. We compare ourselves to the muscle man who is there when we arrive and still there when we leave, our personal trainers (whose full time job is health and fitness), or who we were 10 years ago. We get advice from well-meaning health professionals, Instagram models, and diet culture telling us we must completely transform ourselves, and quickly! But focusing on all of the ‘shoulds’ builds pressure that can undermine our confidence, lead to extreme and unsustainable exercise routines, and ultimately sabotage our long-term success. Rather than focusing on what you ‘should’ be doing, focus on what you want to do. Start small and start with the exercises you like. Anything you do is beneficial, so celebrate your small wins, knowing that over time they will build into big ones. Social support can really help overcome those initial gym nerves. Bring a friend with you for some moral support or enlist a personal trainer to show you all you need to know to get started. These supports also help you with commitment to sessions and can form a great comfort zone to venture out from when you’re ready. Think about your relationship with exercise. Are you complete strangers? Are you foes (because every time you’re together you feel like you’re being punished)? Is it a drag that you only do to get the results? Or is it a friend that you enjoy spending time with? As well as focusing on the benefits of the gym, try to develop positive associations with going there. The best way to do this is to focus on having fun – do more of the stuff you like, less of the stuff you don’t like, and work at the pace that suits you as a unique individual. Get more advice from Glenn and a free ebook full of mindset hacks for eating, movement, weight management and body image at Weight Management Psychology. Glenn Mackintosh is a leading psychologist in eating, exercise, weight, and body-image and the founder of Weight Management Psychology.